Are you ready for a fun and great adventure on the water? I'm your Host and Captain, Mike Barksdale. Catching fish is also a bonus. I have been fishing for over 40 years. That's a long time. I first started going out on the boat fishing with my parents when I was 6 months old. From what my mother and father told me, it was the first time they took me across the Columbia River bar into the Pacific Ocean. I guess I turned every color of green there was. I guess you could say I got seasick. Well, that has been the one and only time I have ever been seasick. Mom and Dad broke me in right. Growing up, I have fished with my parents in lakes, rivers, and the ocean. My favorite has always been the ocean. I enjoy the openness and the freshness of the sea. I spent many summers fishing out of Tillamook Bay and the Columbia River. At the age of 12, my parents would stay at the Old Mill Marina to fish all summer, and I would work for the bait shop bagging crab bait and cleaning out the rental boats. On occasion, the marina would let me take out a rental boat to go fishing and crabbing out into the bay. Those were the times. I gained and learned most of my experience from my father. Growing up I got to drive the boat. Dad had been a Marine engineer for over 30 years. He knew quite a bit about the sea. I was running the boat by myself even before I was able to get a driver's license. When I completed high school, I went to work in the auto industry as a service technician. I had worked for various Ford dealerships in the Portland area. I was in the business for 14 years. All along still fishing on my off days. It seemed like I would go to work just so I could finance my love for fishing. I started taking friends fishing for fun that had not experienced fishing before. I had just as much fun watching them catch fish and having fun. That was the beginning of where I'm at today. My friends encouraged me to pursue this fishing professionally. My friends would say I'm wasting my talent working on cars. It was obvious I was pretty good at catching fish, and also knowing where to find the fish. So, one day I have had enough. I bought a boat, quit my job, and went to work as a professional charter/ guide. It sounds easier than it was. I received my 100 ton masters/ 200 ton mates operators license as well as purchasing my 34' Chris Craft Commander boat in the year 2005. I started calling every contact I had met in the auto business. That got me on my way in the Charter business. Most of the business I get on my boat is repeat business. I strive to make every fishing trip as exciting as possible. I pride myself to giving the best and most fun trip possible. I try to make sure that when a client steps off my boat, they have had a great time and can't wait to come back again. If it's not fun, why do it. The majority of the fishing I do is at the beach. My boat, the BARCO III, stays in the water in Hammond, Oregon. 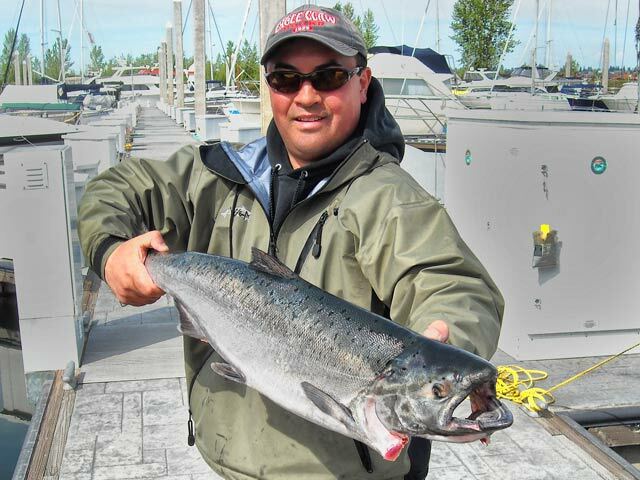 I primarily fish the lower Columbia River and the Pacific Ocean. I am starting to fish more areas as the business grows. There is always potential for growth. Possibly an expansion to the fleet. I want to be able to make myself available to my clients for whatever they would like to fish for. I enjoy the thrill of fishing. Allow me to share that with you!